For several years, I was perplexed by a little place called Singapore. I had never been there myself, but I had read and heard that it is a completely independent city-state on an island in southeast Asia. The more I learned about technology and economics, the more I was baffled by Singapore. How could a single city on an island survive as an independent nation? 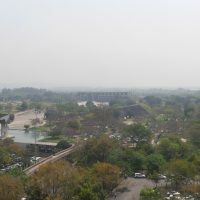 To function, cities need hinterlands from which to draw resources. 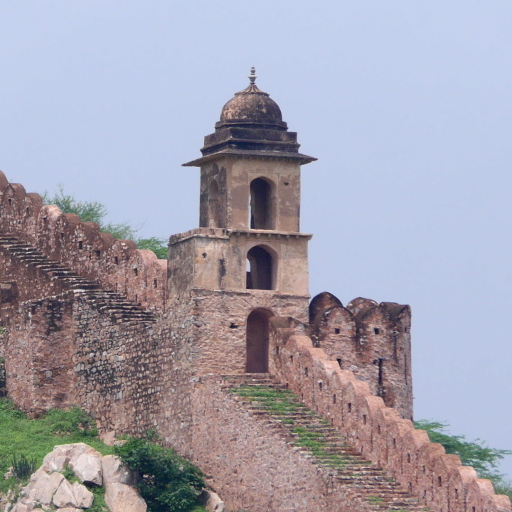 But how can a city’s hinterland be in another country? I was fortunate to get the chance to visit Singapore for a conference earlier this year, the Society for the History of Technology’s annual meeting. Having visited Singapore, and read up on it during and after my visit, I think I have a better understanding of how Singapore can be a viable city-state on an island. Here are some things I’ve learned about how Singapore works. It is true that Singapore is very small for a country, but it is large for a city-state. At 278 sq mi, it is much larger than the other two independent city-states, Vatican City and Monaco, both of which are smaller than a square mile. Singapore has room not only for urban areas, but also highways, parklands, reservoirs, military bases, and even some farms. As Singapore’s population grows, land becomes ever more dear—a problem in dense urban areas around the world. One of Singapore’s solutions to the land crunch is buying sand from Indonesia and using it to reclaim land from the ocean. Another solution is particularly heavy-handed urban redevelopment: unilaterally replacing low-density neighborhoods with high-rise apartment blocks. This has created clean, healthy housing for the common man and woman, but it has also given most of Singapore a generic, characterless appearance. Although Singapore is an island, it is separated from Malaysia (and the Asian mainland) only by the Straits of Johor, which is about as wide as the Hudson River between New Jersey and Manhattan. There are two permanent above-water links between Singapore and Malaysia, the Johor Causeway and the Second Link. The Johor Causeway opened in 1923, was partially destroyed by retreating Allied troops in 1942, then repaired by the Japanese within days of their occupying the island. It has been in use ever since. The Second Link, a longer but less-interesting concrete bridge, opened in 1998. 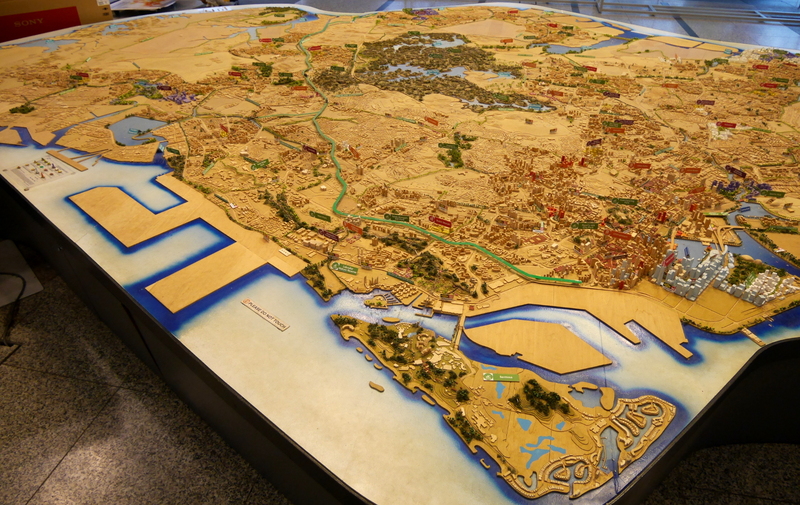 Scale model of the entire nation of Singapore, in the Singapore City Gallery. 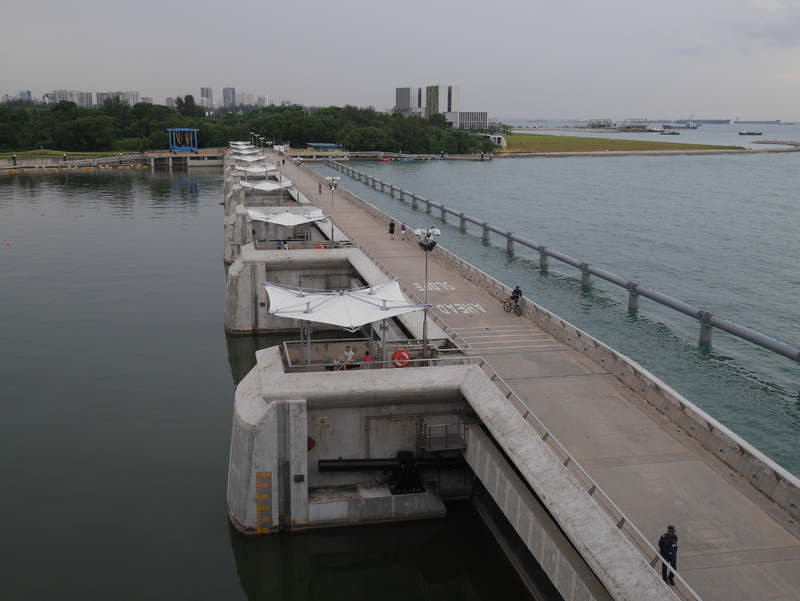 The drainage of Singapore island has been engineered on a huge scale, to save as much rainwater as possible. Singapore’s planners have gone as far as damming the mouth of Marina Bay, adjacent to the downtown commercial district, to convert it into a freshwater lake. Tank at the Newater treatment plant with an integrated visitor center. Marina Barrage, completed in 2008. A highly-industrialized, heavily-urbanized place, Singapore has high energy needs. The island has no petrochemical deposits. Fortunately for Singapore, Malaysia and Indonesia both have an abundance of petrochemicals. Singapore imports crude oil from its neighbors, processes it in refineries, and re-exports the refined products at a profit. 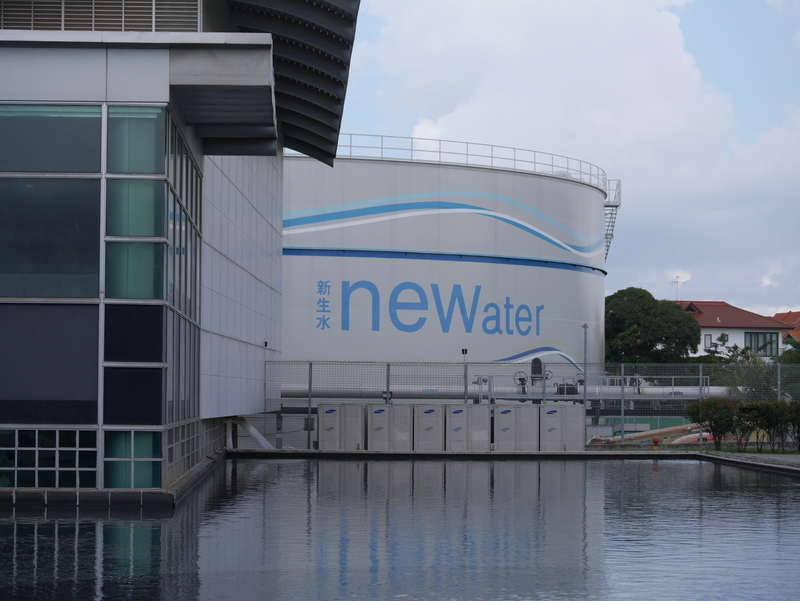 The majority of Singapore’s electricity is generated from imported natural gas. I expected to find that Singapore also bought electricity from Malaysia’s electric grid, but it turns out that the opposite is the case: Singapore sells a little electricity back to its neighbor across the straits. More than 90% of Singapore’s food is imported. 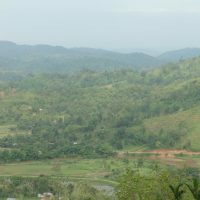 Farms on the outskirts of the built-up area produce some eggs, fish, and leafy greens, but almost everything else needs to be imported. The top sources of fruits and vegetables are Malaysia (of course), China, Australia, and the USA. Despite needing to import everything—or possibly because of this—Singaporeans have developed a strong and distinctive food culture. My favorite experience in Singapore was eating lunch at a hawker center in Chinatown—a food court for inexpensive, tasty street food. I got filled up on a mushroom-noodle dish for S$4.50. Singapore has managed to stay independent and continue drawing resources from its hinterland in other countries because of its robust economy.1 Located strategically on the Straits of Melaka, Singapore has been an important free-trade port almost from its founding in 1819. The city-state’s industries include ship repair, electronics, and petroleum refining. Singapore is also a center of international banking, and its airport is a major hub in southeast Asia. Singapore has been able to sell itself as a clean, hassle-free (if generic) Asian travel experience, and tourism is thus a major part of the economy as well. Singapore is an orderly, well-managed country. It is a demonstration that technocracy can work on a small scale—as long as you are able to banish your messy hinterland to another country. 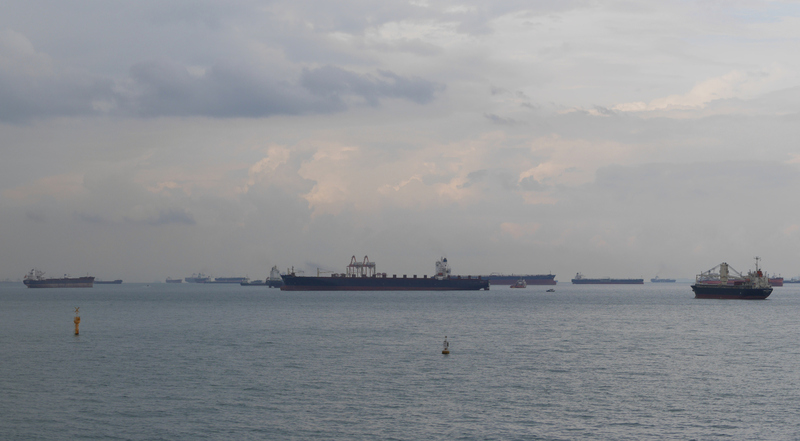 Ships anchored off Marina Bay, Singapore.